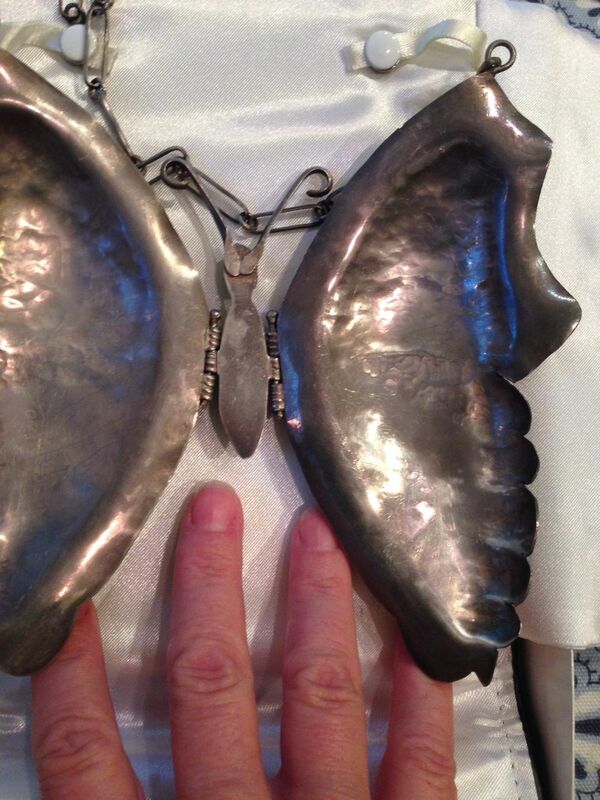 Enormous Butterfly Necklace – Is it Ceremonial? 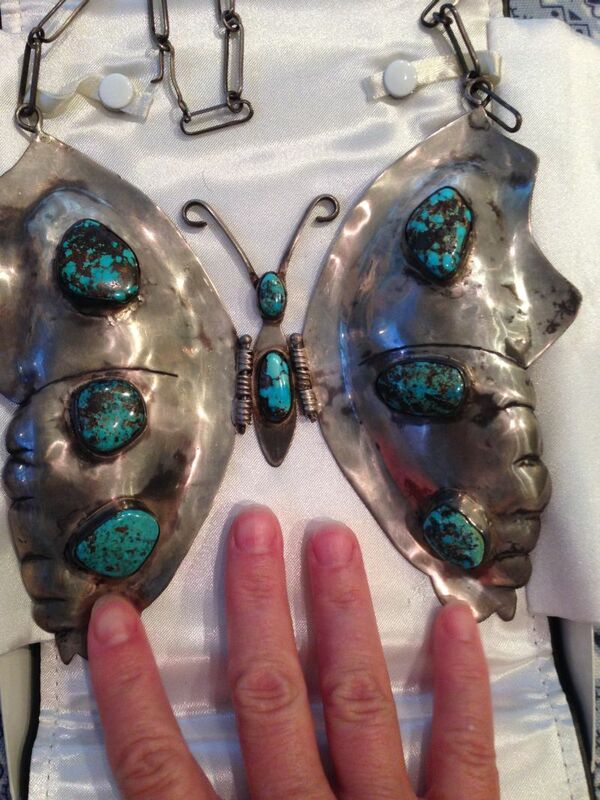 I bought this enormous butterfly necklace through a friend of mine in Arizona over twenty five years ago. I paid three hundred dollars for it at the time. I can not find any Hallmarks nor can I find anything comparable on the internet. I was told it was a ceremonial type necklace for the Butterfly Clan. I think the workmanship is a poor quality and may be old pawn jewelry. Can you help me identify and value this piece? I think I bought this necklace from an indian artist I used to know many years ago. He often introduced me to other artists and I usually would purchase some wonderful art work. This butterfly necklace was something dear to my heart and I enjoyed it for many years but in the last fifteen years or so it just sat in a box. I would like to know more about it if that’s possible. I couldn’t find any marks or signatures. I tried to keep it clean many years ago but haven’t done much in over ten years. It has gotten quite dark. Is it better that I not try to clean it? How do you recommend I store it so it won’t get any blacker? I hope these pics are okay. I have some more if you like. I appreciate all your effort and wisdom. I don’t think such a beautiful pendant should just sit in a box for decades. Someone should actually enjoy it. On the other hand if the value is not much I will hang on to it a bit longer. I did show it to a Native American artist and dealer in jewelry. He said it was made around 1960 and the stones are from a mine that has been closed for a long time, the Morenci mine. Even thought the stones looked mixed, he said they were all from the same mine. He also said the silver was a lower grad which contained nickel. He did appreciate the artistry and thought it may be Tau or Navaho. I’ll start with the quick ones to answer. Materials. It would seem that it would be made from nickel silver or coin silver. You can read all about silver here. It seems to be hinged, has a hand made chain and lovely set turquoise stones in smooth bezels and I would agree that it looks like it is from 1960-70. The Morenci mine is a copper mine that is still fully operational but the turquoise portion had been closed (and buried under rock) for a number of years. Care – It looks great for a vintage piece. I’d keep on doing what you are doing as far as storage. If it is tarnishing, you could wrap it in anti-tarnish cloth which you can purchase by the yard on the internet or at a sewing store. Tribal affiliation. You mention Butterfly Clan but I doubt this is Hopi. I’m not familiar with Tau. I would guess Navajo made. Here are some examples of typical butterfly motifs and their tribal affiliations. 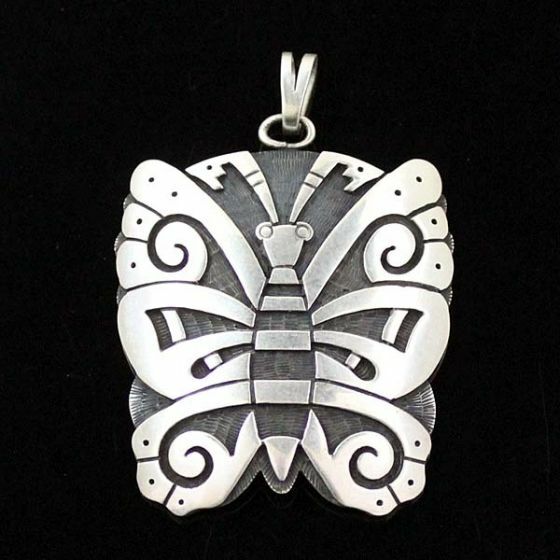 Hopi Butterfly pendant by Kevin Takala. Note the textured background and silver overlay, typical of Hopi jewelry. As far as significance or ceremonial use, that is always best obtained from the person who made it or it was purchased from. Each Native American tribe ascribes their own legends and stories to the butterfly. Butterfly attributes can range everywhere from beauty and transformation to vanity to untrustworthy trickster. 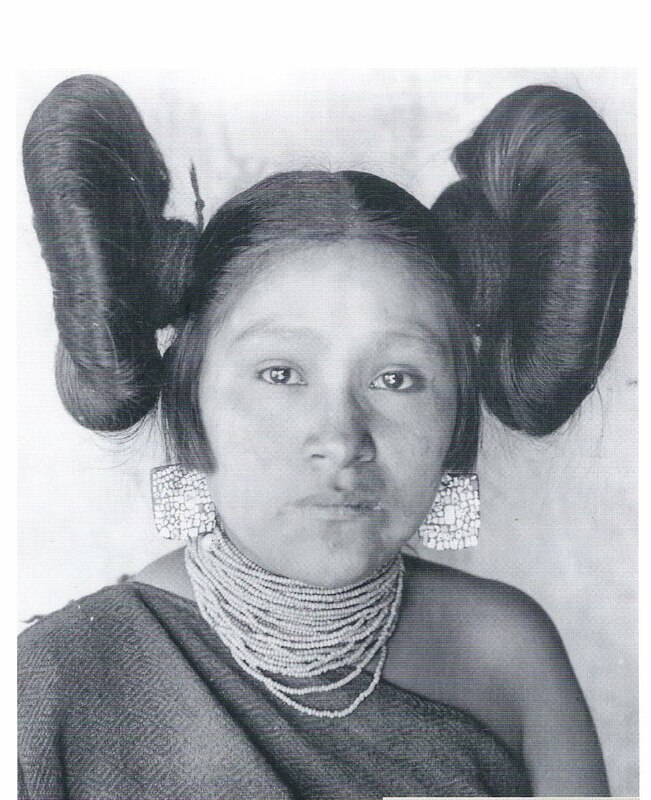 Here is an example of the butterfly hairdo on an unmarried Hopi woman. To read some of the legends, I suggest a google search something like “Navajo Butterfly Legend” and a similar one for Hopi and Zuni.